On the mid of this October, I was on a great conference dedicated to the React.js in the Amsterdam – ReactNL. You can check the program of the conference here http://reactnl.org/#program. As there were a few streams I was not on all the speeches, but I will try to do my best to share what I have heard (and yes, I think there would be a video from all the speeches). Originally I have created this small talk review for my teammates that were not at the conference, so they were able to get what there was. 1) “Styling React.js application”. Really good talk about how the styling is currently done in the react components. 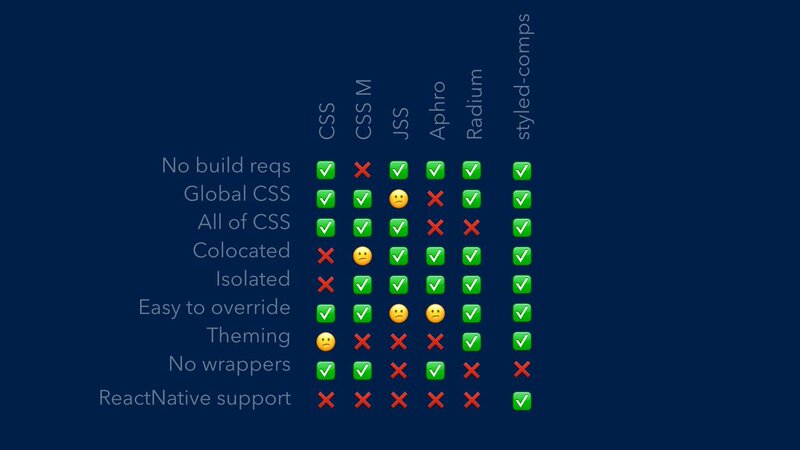 Max had compared all existed technologies (one of the slides from his speech https://pbs.twimg.com/media/CupKNldWIAA39zp.jpg) and presented new one that he + open source community are currently developing – styles-components https://github.com/styled-components/styled-components. It’s great! )) Still raw, but it is great do not have to make state changes just for handling hover state for the button. I have tried it on the small project on weekend and it’s interesting to play with and very suitable to use. 4) “Modernising Legacy Codebase”. talk about how the project was transferred from the mix of the technologies to the Redux + React (not from Angular). In general, they are using such approach – changing the app piece by piece, and find the way for communicating data to/from this pieces to other parts of the app. 7) “High-Stakes React” – Just fine speech about how to do testing. 8) “Rich text editing with Draft.js”. I was expecting that it will be just an example of the using draft.js in the real project (presented here https://www.youtube.com/watch?v=feUYwoLhE_4), but the speakers + open source community have improved it and start the project that allows easier working with different plugins with draft.js – https://github.com/draft-js-plugins/draft-js-plugins/ . Also, there is an experiment to replace existed in WYSIWYG functionality by the draft.js https://draft-wysiwyg.herokuapp.com/. Other resources about draft.js https://github.com/nikgraf/awesome-draft-js. I think this draft.js is pretty nice, and if you are using the text editor in your project it’s quite good to be considered among your react components. 9) “How to build compiler”. Nice fancy educational talk about how the compilers are actually working. 0) premium talk: “introducing yarn”. In every, just every talk speakers made some kindly jokes like – “yes, this is also available through yarn”. In this last talk, James presented the yarn, no much more information that is available in official press release.